I'm pretty sure that every kid I know is a fan of Dinosaur Train... I'm not sure how PBS KIDS does it, but it seems as though each new show that they introduce to their lineup ends up being a favorite. There is just something universally appealing about Buddy and his adoptive family of Pteranodons and their whimsical adventures through prehistoric jungles, swamps, volcanoes and oceans. With each episode as they unearth basic concepts in natural science, natural history and paleontology, kids are learning while also being entertained. And who could not be excited about the Dinosaur Train itself, the colorful locomotive customized to accommodate all kinds of dinosaurs with the ability to visit the Triassic, Jurassic and Cretaceous worlds? My girls love the Train's Conductor, a knowledgeable Troodon, and the way he provides passengers with fascinating facts and calls out "Time tunnel! Time tunnel approaching!" in each episode. In addition to the award-winning television series, however, there is much more that the Jim Henson Company has included to boost the interest in scientific thinking and Dinosaur Train. On the interactive website, there are plenty of fun games and activities and kids of all ages will especially have fun with Flying with Buddy. This slightly addicting game, ahem, reinforces counting skills as players use the mouse to control the flight of Don, Tiny and Buddy. After one minute of the trio cheerfully collecting seashells, they return to their nest to count the treasures they have collected... and then you'll want to play again to beat your score! 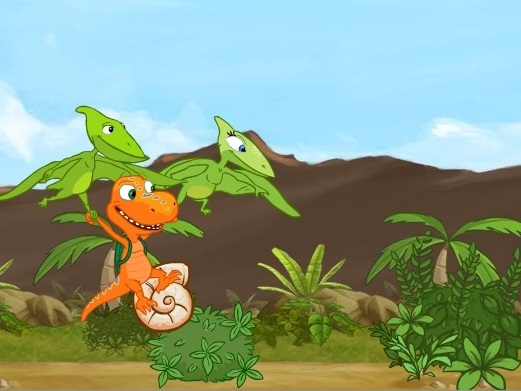 Or, for more family fun, check out the information on the Dinosaur Train geocache program - a fast growing adventure game that inspires families to get out and discover treasures together. A great way to get the whole gang up and moving and enjoying the outdoors and spending time working together! 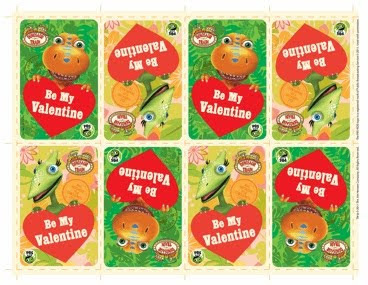 So, for the Dinosaur Train fan in your life, there's no better way to celebrate Valentine's Day than by taking advantage of the free Valentine's Day card download available now from PBS (or directly from the PDF). What a cute way to celebrate the holiday with this Valentine's Day 2011 exclusive card! For an additional way to not only celebrate Valentine's Day but to have fun all year long, Pressman Toy now offers your little enthusiast the Dinosaur Train Make A Match game to extend the fun of the show right into your living room. In this colorful matching game, Buddy and his friends sharpen children's memory skills with cute cards and a Buddy figurine. 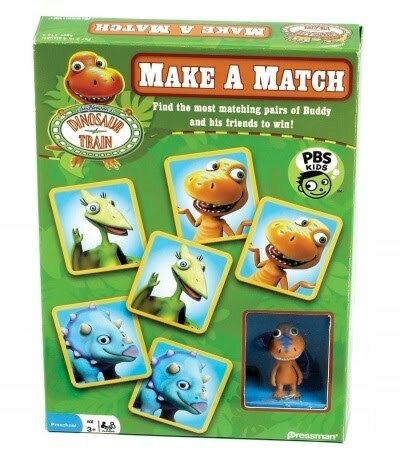 Similar to memory except with innovative additions such as "Take Buddy" cards, "Wild Cards" and "Lose a Pair" cards to add excitement, Dinosaur Train Make A Match is designed for 2 to 4 players (ages 3 to 6) and is available at Toys "R" Us stores nationwide for just $9.99. 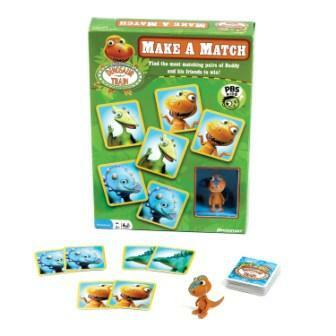 One lucky person will win a Dinosaur Train Make A Match game! To enter to win: Visit Pressman Toy and tell me another of their games that looks like fun. 1 Extra Entry (per method) if you follow the Jim Henson Company on Twitter, Like them on Facebook, follow Pressman Toy on Twitter and/or Like them on Facebook. 3 Extra Entries if you blog about this giveaway linking back to Thanks, Mail Carrier and PBS KIDS Dinosaur Train. Please leave an address where it can be found. Giveaway will end on March 4th at 11:59pm CST. Do me the favor of leaving an email address or making absolutely sure it is visible in your profile, I have to have a way to contact the winner. The winner will be chosen by random.org and announced here as well as emailed and will have 48 hours to contact me or respond to notification or a new winner will be chosen. This giveaway is open to U.S. residents only. A big thank you to PBS Kids for providing a Dinosaur Train Make A Match game for one lucky giveaway winner. The opinions shared are my own and honest and if you really need to see more, click here to see how I roll. I would also like to have the Shopping Cart Dash Game to play with my kiddos. It looks like fun. I also entered tehe Gnome and Juliet giveaway. I subscribe to Thanks, Mail Carriers email. i also like the drinking game! My daughter would love the curious george 24 piece puzzle! I think the nickelodeon tri-ominos for kids looks like a fun game to play with my kids. Dinosaur Train Pop N Race Game looks like fun. I have always liked Rummikub! The The Office Board Game the Sequel would be fun to have! I entered the RumbaTime giveaway. I would like to have the shopping cart game to play. I follow Jim henson on twitter. Like Jim Henson Co on fb. I also like the dinosaur train Pop and race game. NCIS The Board Game looks fun for adults! The Rummikub game looks like fun. 1...I'm an email subscriber to Thanks, Mail Carrier. I entered the Build-A-Bear giveaway. I entered the Remington Curling Iron giveaway. I entered the Sterling Silver Jewelry Gallery giveaway. I like the Scooby Doo game too. My son loves both of these cartoons. Tri-Ominoes looks like a lot of fun. I entered your Leapfrog DVDs giveaway. I entered your Cool Care giveaway. I entered your Sterling Silver giveaway. I entered your Build a Bear giveaway. I entered your Jennlinn giveaway. I entered your Bag Holder giveaway. WaveLength looks like a great game. Jumpin' Monkeys looks super cute. I entered your Big G & Hot Wheels giveaway. I really want the NCIS game :) love the show. I entered your Guidecraft Nesting Toys giveaway. Rummikub! I can't wait until my son is old enough to play. And good heavens do we love Dinosaur Train in this house. The Nickelodeon Triominos look like fun. I entered the guidecraft nest & stack giveaway. I entered the leapfrog DVD giveaway. I entered the Big G & Hot Wheels super fan giveaway. I entered the Comfy Sacks giveaway. Nickelodeon Tri Ominos looks like a lot of fun! Squiggly Worms looks like something my kids would like! The NCIS board game looks fun! Entered the Big G & Hot Wheels giveaway.